The Literary World suffered a major blow yesterday following the death of the great Terry Pratchett. I've only ever read one of his books (shocking, I know) but I know people who absolutely adore him, and rightfully so. He was brilliant at what he did. 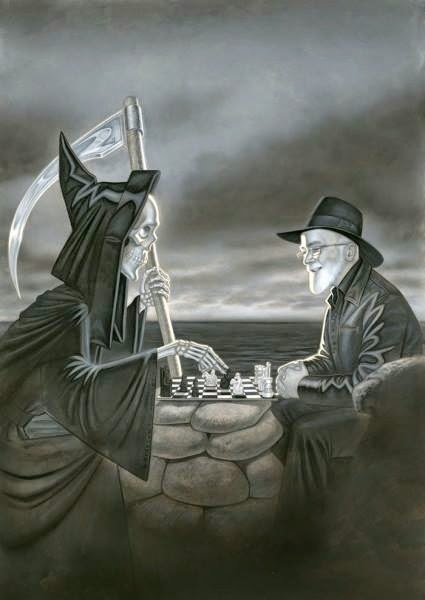 I remember my first run-in with Pratchett - well, not him in person, but his work. I was still at school and we were celebrating some kind of book week (I can't remember what) but they had a poster of Soul Music by Terry Pratchett on their wall. I fell in love with this poster and asked if I could have it after, which they let me, and it sat on my bedroom wall for years. 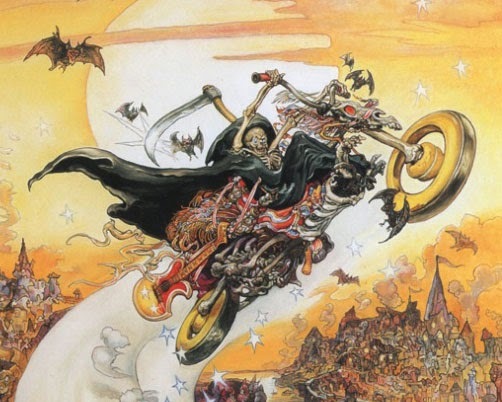 It depicts Death on his bike. If there's one thing you can say about Pratchett, it's that you could tell one of his books a mile away. Their covers and illustrations by Paul Kidby are so unique. They're busy, colourful, and manages to capture the style of his work to a T. Even those who don't read Pratchett can recognise his work by the style of the covers. They're so imaginative. With the sad news of Pratchett's recent departure, I thought I'd dedicate this week's Pic of the Week to him, and I've chosen piece by Kidby himself. So, in memory of Sir Terry Pratchett. Rest in Piece. One of my WIPs has a reaper on it, so these are great for my inspiration. Thanks! I thought so too...quite moving really. And We're Off To Barbados . . .
Just A Little More Paper Mache . . . Trick of the Light . . .